Today's post has quite a few pictures. We spent today going to several places we didn't hit last time and Scott took a ton of pictures so I wanted to share a few. 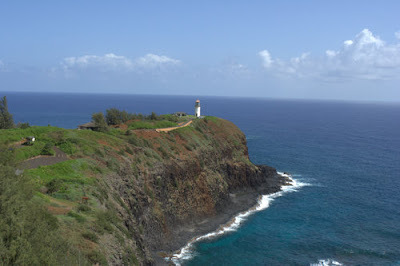 We first went to the Kilauea lighthouse. 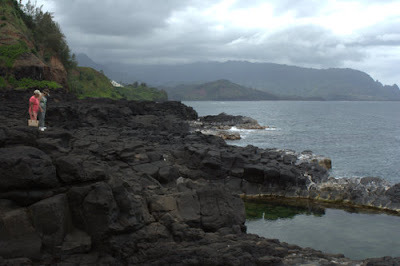 This is the very most Northern part of the Hawaii Islands. You get to walk out to the lighthouse and you get some great fews of the north shore. 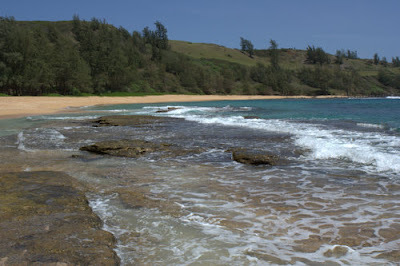 Then we headed over to Moloa'a Beach. We hadn't been here before - it's off the beaten path and BEAUTIFUL!!! Scott took a ton of pictures here. I was standing knee deep in the water and somehow maynaged to trip and I fell on some rocks and got a huge gash in my leg. Lovely. This is a great accessory for all the dresses I brought. 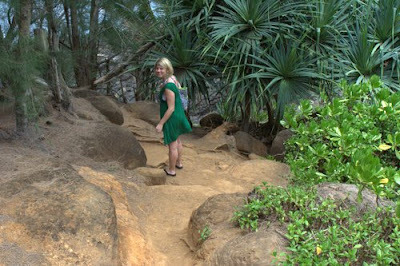 Then we took this hike down to some lava rocks and a place called Queen's Bath. It was kind of a hard hike (for two people who NEVER hike and I was wearing a dress and flip flops) but it was worth it. 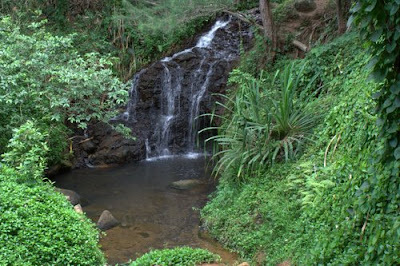 We saw this great waterfall on the way. Here I am climbing down. It's a miracle I didn't fall while I was hiking. 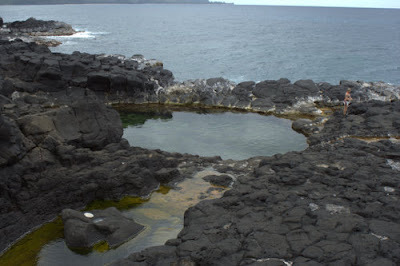 This is Queen's Bath - it's a natural swimming pool. You can get in it and swim (we didn't) - it's fed from the Ocean. Tonight we ate at one of our favorites - Duke's Canoe Club. We had our favorite dessert - Hula Pie! You can probably see why!!! 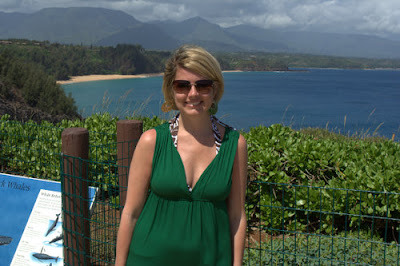 We had this in Maui on our honeymoon and the last time we were here. It was good to the last bite!!! I'm sure you have all been thinking about the 10,000 people in China who have died in that earthquake. I can't get them off my mind. I've been praying for their families. I hope you will too. I just keep thinking that most likely 99.9% of those people weren't Christians. I'm also praying for all of those who live near us in AR, MO, and OK who have had terrible tornados. I'm so ready for the spring storm season to be OVER!!! I love all the pictures. The waterfalls are amazing and that cake is unreal! Very beautiful scenery...very cute dresses...too bad about the knee injury BOOOO...that dessert looks AMAZING...and your story about Wal-Mart made me almost spit out my oatmeal!!! Those pictures are amazing! I love all the views and the pic with you and the waterfall is gorgeous! And the walmart experience is TOO FUNNY. Also, I want that pie in my belly. Your updates make me so happy! 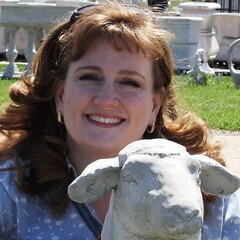 Kelly, I found your blog from another blog and I love reading it. 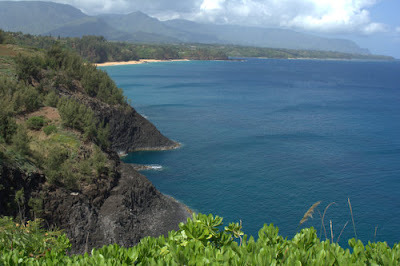 I have been to Kaui and I absolutely loved it. It is so beautiful there and I've enjoyed seeing all your pictures. Hopefully I will be able to go back again someday. I was just wondering if you have ever eaten at the restaurant called the Hanalei Dolphin. If not, I highly reccommend it. It was one of our favorite restaurants. Hope the rest of your trip is great. God Bless! 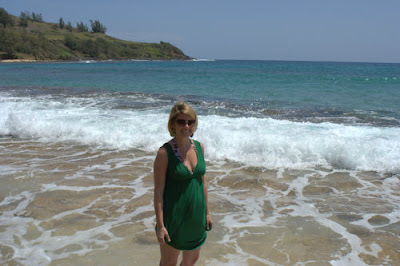 We went to the Queen's Bath on our honeymoon, and I was wearing flip-flops, and I DID fall down!!! I think we have it on video. It's a beautiful place! WOW! The lighthouse, the waterfalls, the beaches...they are all breathtaking! 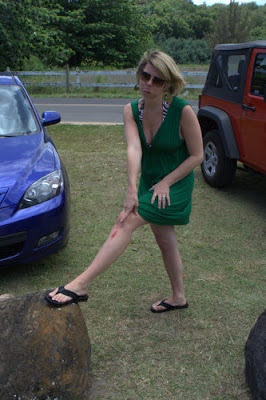 Sorry about your booboo =( I love the pic of you in front of the waterfall...so pretty! I had NO idea there was a Wal-Mart cheer! I think Scott needs to sing it for us so we will know how it goes! Funny stuff! I am so glad you and Scott are having fun! I have enjoyed looking at the pictures and seeing the beautiful scenery. My husband and I are ready for another vacation! BUT YOU TWO ARE SOOOOO CUTE!!!!! scott is such a great photographer!!!!! you are darling in the pic with your lip sticking out and oh the one with you sitting solo by the waterfall...that might be your next profile pic!!!! you are so beautiful!!!!!!! ps i need that green dress like yesterday!!!! where did yoy get it?????????? thank you for your prayers for the china people. my dear friend is in the middle of it!!!! oh that they would get amazing chances to share the gospel!!!!!!!!! He is at WORK KELLY!!!!!!! PRAISE HIM!!!!!! What beautiful pictures! I need that cake like now!!! I'm sorry you fell down. That is so something I would have done!!! Kelly, I love the pictures. I don't know anything about Hawaii, but..are you anywhere near where they film LOST? My fav.show! The pictures of the waterfall are absolutely beautiful! Kelly- I love the pictures you guys are taking! It's such a great way to start my day! Beatutiful pictures!! It looks like you had another wonderful vacation day!! So glad y'all are having a good time. I've been praying for you! The picture of you in front of the waterfall is gorgeous! Bummer about your new leg accessory! You did a marvelous job of masking it in your dinner shot with your tricky pose and your purse! Great pictures...isn't it amazing to consider that Heaven will top anything we see on earth?? Love the shot of you in front of the waterfall. I'm guessing your husband will have that one on his desk soon! Hope you have another great day in paradise! Can't wait to see what dessert you've enjoyed tonight! Once again, it looks BEAUTIFUL there. I'm glad you are having such a wonderful time, but you're killing me with all the food pictures ;) I think it is so funny about your trip to Walmart. I think you should go back again, you know, to inspect some more! That cake looks great!! Wish I was eating that! I am totally cracking up about the guy at Wal-Mart! He will probably be telling everyone about you guys for months! It looks like you're having a blast. I've enjoyed seeing new pictures every day. I love your daily updates!! 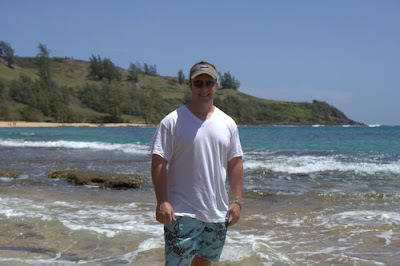 I know Brian is getting sick of me saying (everyday after I read your blog) "I want to go to Hawaii!!!" The pictures are just so beautiful and the food makes my mouth water. I love that you're always having dessert! My motto is to eat dessert first and then the meal - what if the Lord comes back before you finish the meal?? You need dessert - ha ha. I wish I was there. We went to Hawaii in '98 and have always wanted to go back. Once again I love all the pics! =) I've never been and it's sooooooooooooo pretty from yalls eyes!!! Your killing me with all those HUGE WONDERFUL looking desserts!!! YUM-O! One of my favorite pics is the one of you where yall are hiking! I love the rocks...that is a cool looking trail! I hope yall continue to have an AWESOME time!! Thought you might like to check her blog out! I'm going to send her a link to your blog...so she can see all your pics! I love the picture of you in front of the waterfall!! I haven't been on in a few days, and was so excited to see all the pictures! You look so beautiful in all of them- I love your dresses! Kelly, what beautiful pics & looks like y'all are having a great time. You're such a faithful blogger posting pics every single day of vacation, LOL. We're leaving Sat. for the beach, but I've decided to take a weeklong break from blogging next week. These pics make me even sadder it's a cloudy day here! The waterfall and beach pics were to die for! Thanks for sharing the Wal-Mart story...I had a huge smile on my face picturing what the checker's face must have looked like! LOVE these pictures and I really love love love that dessert photo. Ha ha! Thanks for sharing! Looks like you guys are having a great time and getting lots of r &r. I mean hawaii...couldn't you move there? my sister did 15 years ago and hasn't come back yet. I'm loving all the pics because it is bringing back good memories of our trip there. Plus you are hitting all the good restaurants...the pizza place...ahhh. Have you had a plate lunch yet? those are greg's favorites for after the beach.